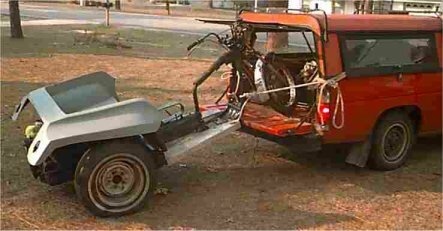 While we are waiting for things to come together on the Corvair Trike Project, me and my partner "the Corvair Dude" (aka Wizzzard) decided we did'nt want to wait any longer to ride so a new project was born. I got busy looking for some raw VW material to work with and on the BTW site (of which I am a member) I found a rough project which I thought was worth working on. 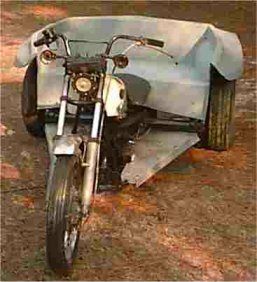 Well, we took a trip to Florida and brought back the project trike that is pictured below. Stay tuned for the on going story and pictorial of this project. "THIS TOO SHALL RIDE AGAIN"
Frame and Forks are Honda. 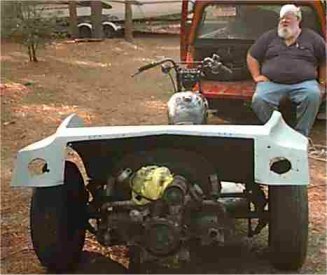 The Honda frame is mated to a Dune Buggy rear end. 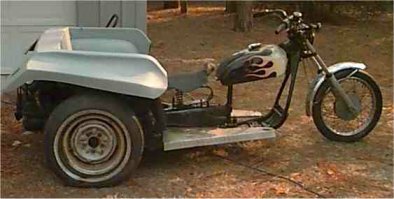 It curently has a 1200cc motor on it with a 4 speed transmission with swing axle . (Oh, that's my bro "The Corvair Dude" sitting on the truck! Take a good look, she won't look like this for long. I hope to have some picture updates comming soon. 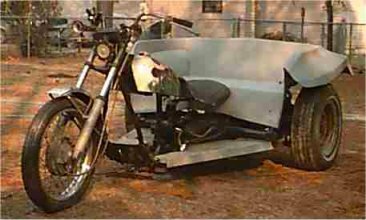 Well, this is not the trike we had hoped to start on but any ride is a good ride and she's gonna be great!